Jim Martin, Senior Consultant of The Registry, has followed a career as a provost, dean, professor of English, and co-author of seven books on higher education leadership and management with Johns Hopkins University Press. Dr. Martin has also taught in the Graduate Program in Higher Education at Boston College. He holds an A.B. from Colby College and M.Div and Ph.D. degrees from Boston University, and is also an ordained United Methodist minister. After having taught at Suffolk University, the University of Massachusetts, Lowell, and Merrimack College, Dr. Martin became a professor of English at Mount Ida College where he also served for more than fifteen years as Vice President for Academic Affairs and Provost. 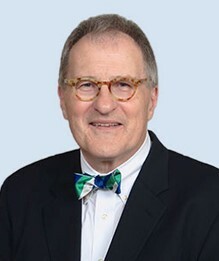 Dr. Martin has authored and co-authored several hundred columns on higher education for University Business magazine over the past 25 years, and some of his titles from Johns Hopkins include, The Provost’s Handbook: The Role of the Chief Academic Officer, Presidential Transition in Higher Education: Managing Leadership Change, and Consolidating Colleges and Merging Universities: New Strategies for Higher Education Leaders. He is also a Senior Contributor for editorial content at HigherEdJobs. In his capacity as a minister, Dr. Martin is a long-time member the New England United Methodist Eldercare Board of Trustees, serving seniors in Rhode Island and Massachusetts.